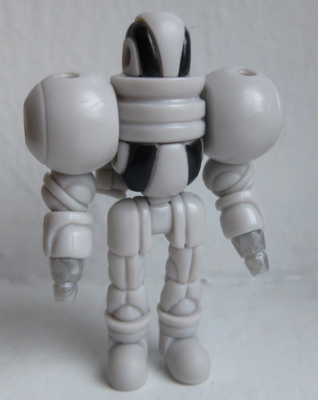 This is the thread to post any tips you've got when building or customizing Glyos! 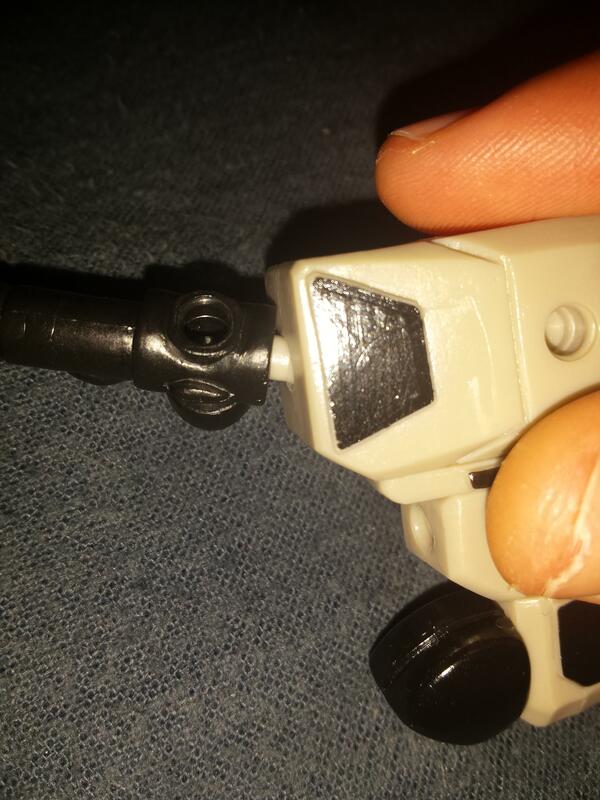 You can use a Callgrim gun assembly to pull switchpins from thicker Glyos pieces (Weaponeers, etc), which definitely makes it less likely to destroy your fingernails! First attach the gun to the pin (as shown above) then try to use lots of force while bending it to the side (it's hard to describe, but you'll see what I'm talking about). The pin should come out far enough to make it fairly easy to remove manually. The divot on the bottom of a BIC lighter is perfect for pushing in switch pins. When cutting the Traveler's right hand to open it up and have it hold things, start at the bottom of the hand, against the palm, and work towards the thumb. I wouldn't try this with any other figure's hands though. Except maybe Noboto. NoPaintRequired wrote: When cutting the Traveler's right hand to open it up and have it hold things, start at the bottom of the hand, against the palm, and work towards the thumb. I wouldn't try this with any other figure's hands though. Except maybe Noboto. I'd never have thought of doing that, but just having had a look now, that seems totally doable. Have you got pictures of a successfully opened Traveler hand? Mainly for Skeledens to hold their ax deeper. Now when I say open, I don't mean splayed out, but to allow it to wrap around things like cords or other toy accessories. Dude, that is awesome! Thanks for the pic. NoPaintRequired wrote: Mainly for Skeledens to hold their ax deeper. Now when I say open, I don't mean splayed out, but to allow it to wrap around things like cords or other toy accessories. I was nervous with the early releases of the Skeleden armor, that it felt like I would tear the axe before. Since the Pyrosurge release though I felt more confident with pushing the axe, and I've stopped. I have been able to do it with just a lot of playing with the figure but a little hairdryer magic helps greatly. It helps with the Imaginext weapons greatly though. Ersico showed me this trick like three years ago. If you want a cheap switch pin, you can get a set of 60 of these things at Hobby Lobby for like 2 bucks and some change. The flamey end also makes a good muzzle flash for Glyos guns. So, found out something interesting. See the feet here? Those originally had tampos. Turns out, if you have some Brasso, a cotton swab, and some patience, you can actually erase the tampos from Glyos parts. Just be sure to wash the piece afterwards with some dish detergent and warm water when you're done, dry, and it should be good to go! Now, here's the hitch: for non-metallics, it will leave a matte finish on the piece, in contrast to the shinier finish on most Glyos parts, and it can be downright impossible to completely clean a seam line. Just one last thing: if you try this, please do so in a well-ventilated area! Matt wrote: I use one of the standard "treasure" shipping boxes (not the extra big one) with a "c" cut horizontally (like the c is laying down on its opening) in the middle area of the box. I then slide the hairdryer in that slot and heat everything for 40 second bursts, shuffling the parts inside the closed box between blasts. You'll end up doing this multiple times throughout a larger build. Often, I'll also heat all the separated parts up for a specific build and let them sit for a few hours before I get started, letting the "memory" of the shapes and fits return to their original state. This can even the playing field and help with loose connections that happen from certain parts combinations and connection pressure. After I complete a build, I'll then heat the whole assembled thing (sometimes the extra big shipping box comes out for mongo-sized ones) and then let it sit an hour before handling it. I've always used a hot box for disassembling Glyos, but never thought about the pre- and post-heating techniques!